The focus of this Action Research was a class at IH Cordoba Sierra. The students were a group of elementary level teenagers aged from 13 to 17. In our sister school this level and age-group combination has been phased out because it is thought that students who reach their mid-to late teens with only elementary level in English after 8 years of study must have other learning issues. I believe that as the school provides beginner or elementary classes for adults, there should be the same level for teenagers. The main aim of this study is to see whether Community Language Learning (CLL), along with other activities focussing on promoting self-esteem, are a viable method of supporting a group of young people to overcome some of their difficulties and acquire a better level of English. 1 – For the class to pass the school’s internal level exam and to move on to the next level. 1 – Using the school’s internal level exam which is the same for all students of this level. The exam assesses listening, speaking, reading and writing skills as well as grammar and vocabulary. The academy requires a minimum of 60% to move on to the next level. 3 – According to Baxter the only real measure of this can come from the students themselves. “There is really only one question that can assess a learner: Do you feel you have improved? (Baxter p.57) Therefore, I asked the students if they felt they progressed in CLL conversations, in homework writing exercises and in class questionnaires. The class took place twice a week and most of the students had studied English together before. They began the academic year in the fourth and final term of an elementary course, and then had to pass a level exam in December to move on to a pre-intermediate course. These students demonstrated nervous, despondent, evasive and anxious behaviour from the very beginning which took the form of alternately loud communication and silence, failure to engage or participate in class activities, giggling, refusal to speak English at all, over-dramatic and deliberate clumsiness, arriving late to class and failure to complete homework. It seemed a natural reaction to the frustration and embarrassment of years of study with little progress. They needed to gain confidence as they were afraid of making fools of themselves and not understanding which led to anger or a refusal to participate. 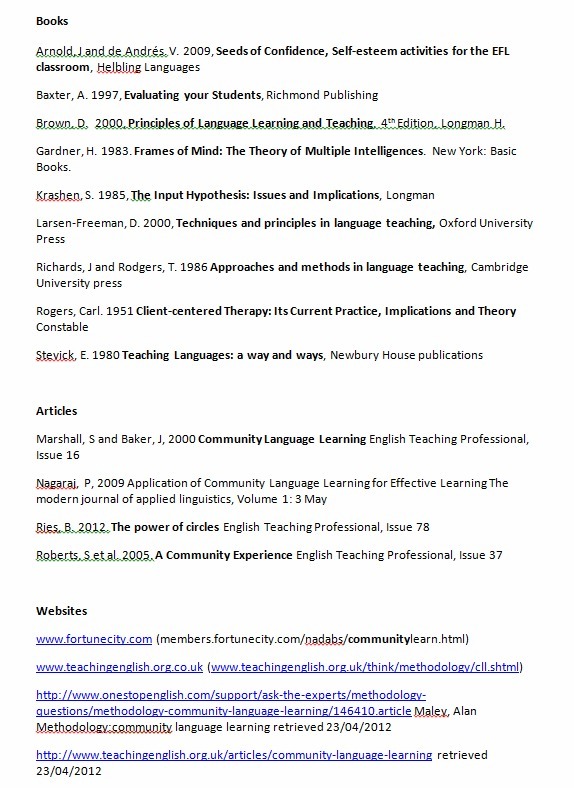 Methodology – what is Community Language Learning? Community Language Learning was created by Charles Curran and Paul La Forge, inspired by the humanistic psychology of Carl Rogers. In CLL the student is recognized to be not only a thinker but also an individual with feelings and emotions and is often referred to as a “humanistic technique”. CLL aims to provide a relaxed, non-judgmental environment where students are confident to take risks and will therefore be more successful. The students sit in a circle around a recording device. The teacher remains on the outside of the circle, whilst the students face each other. Students have time to think about what they would like to say, the teacher is not involved in deciding the topic of conversation. A student whispers a message to the teacher who translates or interprets it in the target language and the student repeats the teacher’s translation. Recording – when a student signals that they would like to speak, they tell the teacher what they would like to say in L1, the teacher says it back to them in manageable chunks. As the student repeats each chunk, they record it until the whole utterance is recorded. At higher levels, the student can attempt to say what they would like to say in L2 and the teacher reformulates the utterance back to them. When another student signals that they would like to say something in response, the teacher moves around the circle to help them. Students continue taking it in turns to record themselves speaking for about 10 minutes. Then the group listens various times to the whole conversation. Transcription – The teacher then transcribes all or part of the conversation onto the board. The teacher asks for translations of each phrase from the group as they are written up. Stevick (1980) says that students should be discouraged from writing their own copy at this time. Language Analysis – the teacher highlights some of the language e.g. a useful structure, and answers any queries the students may have. Practice – the teacher might organize the class into small groups or pairs to try to build new sentences using the structures that have come up from their conversation or to have a conversation on the same topic as the recorded conversation. Each group presents a summary of what they discussed to the rest of the class. Reflection – finally, students are asked to think about the class, they may listen to the recording one last time. They are asked to talk about the experience. Stevick (1980) emphasizes that the teacher must receive the students’ comments in a non-judgmental manner by the teacher to encourage the learner to feel secure in their learning environment. CLL is a humanistic approach which supports the fragile esteem of the student, making it ideal for this class of nervous, anxious students. The students in this class were nervous of criticism and of making mistakes. In CLL there is no correction but instead reformulating or translating helps students to see that making adjustments is a normal part of the learning process. As these students were not used to taking responsibility for their own learning, I hoped that CLL would promote student autonomy. In CLL students are using the language as a means of communication rather than reciting learned forms. This relevance should create interest, motivation and aid memory. The time for copying gives the students quiet time to process the language that has been or will be looked at and gives them their own record. CLL requires a lot from the teacher. Firstly, the teacher must be proficient enough in the students’ first language to translate instantaneously and secondly, the teacher must analyze the language produced on the spot, select the relevant parts to highlight and motivate the students. The presence of any kind of recording instrument could make the shy students even more reticent to speak. Students may not have ideas of what to talk about. In one fundamental way, the methodology seems flawed; if students whisper what they want to say to the teacher and then it is translated for them and the translation is repeated for the class, how do the rest of the class understand what was said and respond to it? The methodology was heavily based on CLL but not bound by it as there was continuous adaptation and experimentation. The struggle of a pure CLL method with this class could have been de-motivating and therefore counterproductive. I changed some of the traditional CLL procedures described above to counter some of the disadvantages e.g. students did not whisper to me but spoke first to the group in Spanish and then translated into English. I did not use a recording device as I was concerned that it would make the students more reticent to speak. I asked all students to participate at least once in the CLL conversations and they could choose when they offered their contributions. I drew attention to language that I believed was particularly relevant to them, therefore not requiring them to induce what was and was not useful of the text produced. I used CLL-style activity once a week at the beginning of the lesson. They were given the freedom to select a theme or subject to discuss. Other more traditional text-book and teacher-led methods were incorporated into some classes in order to complete school targets and fulfill both student and parent expectations, along with a variety of other activities focusing especially on building self-esteem. I also introduced a student diary which was not corrected per se. I consciously employed all of the above confirming behaviours throughout the course. Explanations, instructions, checking understanding and any discipline were given in L1 in order to ensure that everybody understood. Regularly repeated instructions were given in English and only repeated in Spanish if necessary. One of the most beneficial tools were the diaries. Considering what would normally be expected from students who are approaching pre-intermediate level; the writing was outstanding and showed a marked improvement over the course. 2 – A few of the students continued to exhibit some shyness and were still nervous when speaking, though significantly less than before. All students participated in activities and all students spoke English at some time in every class. All the students said that they felt they spoke better English and named elements of language that they had learned. 3 – Some students stated: “I have learned more this year than last year”, “I think learning this way is good because we speak lots”. They have all moved from elementary to pre-intermediate level, though some struggled with the progress tests. The diaries also demonstrated their improvement. 5 – The most successful activities and methods were: the use of diaries, positive feedback, eye contact, smiles, involving students in the learning process, consistently asking for their opinions and evaluation and the use of L1 in explaining new language. Obviously some teaching methods will work better for some students than for others. In this class there were students who clearly blossomed with the CLL method, whereas others continued to show reticence at speaking in English. All students were pushed to speak in each class which goes against pure CLL methodology and I remain unclear as to how beneficial CLL would be for students who don’t participate. Giving students possible topics that directly related to their life experiences was particularly successful and also alleviated the pressure. CLL was incorporated into an eclectic course and the students passed the necessary exams. As a result, I would agree with J, Bertrand. “Although CLL is primarily meant as a ‘whole’ approach to teaching I have found it equally useful for an occasional lesson, especially with teenagers. It enables me to refocus on the learner while my students immediately react positively to working in a community.” (www.britishcouncil.org) and I regard CLL a useful piece of kit in my teaching toolbox which can be used as part of some, or all, lessons, or only occasionally during a course. These recommendations pertain specifically to working with teenage elementary level students. I believe that we can and should provide courses for students at this age and level without creating too much additional work for teachers. The only difficulty is that I recommend the use of L1 and so teachers need to be sufficiently proficient in order to teach the course. Community Language Learning, along with other activities focussing on promoting self-esteem have supported this group of young people to overcome some of their difficulties and acquire a better level of English. Contrary to expectations, all of the students passed the level test, can now communicate in English and say that they have progressed and enjoyed the classes.